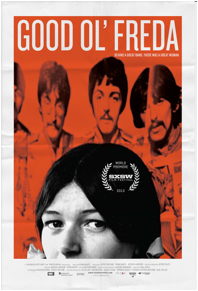 British Beatles Fan Club: GOOD OL' FREDA - Watch the Trailer! Magnolia Pictures will release GOOD OL’ FREDA On Demand/iTunes and in theatres on September 6, 2013. Directed and co-produced by Ryan White (Pelada, Perry v. Schwarzenegger) and co-produced by award-winning photographer Kathy McCabe who initiated and engineered the production of GOOD OL’ FREDA. In GOOD OL’ FREDA, Freda tells her stories for the first time in 50 years. One of few films with the support of the living Beatles and featuring original Beatles music, the film offers an insider perspective on the beloved band that changed the music industry.